Damaged and leaky gutters can lead to expensive water damage for your home. 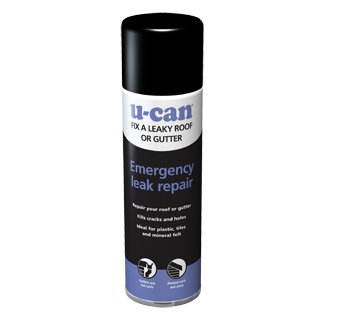 U-Can Emergency Leak Repair is the perfect quick fix for guttering, downpipes and drains – even window and door seals – that will keep water out until you have time to mend them yourself or call in the professionals. 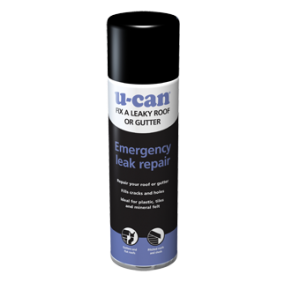 Simply find and dry the leaky area and spray for a 100% effective seal. 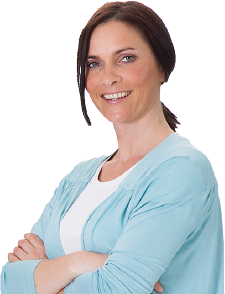 Repairs to guttering, roofs, windows or doors on plastic, tile, slate, flat roofs, caravan, greenhouses or sheds. This easy to use aerosol silicone coating applies an even waterproof layer over cracks and holes to stop leaks, instantly. 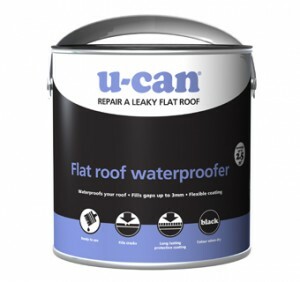 It’s perfect for repairing pipes, gutters, drains and roofing. Anywhere, in fact, water is finding its way into your home. 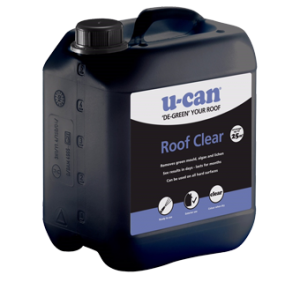 Flat roofs are notorious for letting water pool on top of them, which over time can result in leaks in your shed, outhouse or extension.